Could Princess Cruises’ Future Ship Be Influenced by New P&O Cruises Design? With so many new domestic market cruise ships coming out in recent and future years, there’s plenty to pique travelers’ interest, but sometimes you can’t help but be intrigued by the design of a foreign market vessel in hopes that some new features there may soon carry over here. Such is perhaps the case as Princess Cruises begins building its fourth Royal-class ship around the same time corporate cousin P&O Cruises announced plans for its new one. After all, the latter’s recent Britannia shares many details with the modern Royal Princess, but those were nearly identical classes of vessels. The as-to-be-named fourth Royal-class ship is expected to follow the overall design already established by the Royal Princess, Regal Princess and Majestic Princess before her. Only the Majestic is being customized differently for service in the Chinese market, and the fourth is also being constructed by Fincantieri in Italy for scheduled launch in 2019. 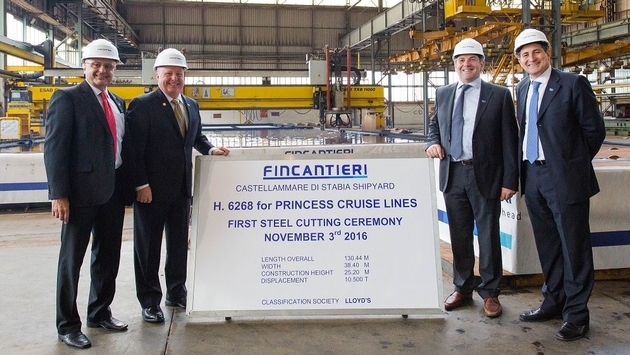 Its initial steel cutting ceremony (pictured above) was held on Nov. 3, 2016 at Castellammare di Stabia, Italy. By comparison, P&O Cruises next ship will be built as a next-generation LNG (liquified natural gas) powered ship at the Meyer Werft shipyard in Papenburg, Germany. It will measure in at 180,000 tons, larger than the Royal-class’ 141,000 tons and showcase some unique features too, particularly The Dome. Described as an all-weather entertainment and informal dining hub situated under a translucent covering, The Dome will enclose a pool and retractable stage, whirlpools and some form of water feature, perhaps a fountain similar to Princess’ great WaterColor Fantasy. The venue will also host aerial performances and roof projections. Also unlike the abbreviated variety on the Royal-class, the P&O ship will sport a half-mile uninterrupted promenade deck with al fresco dining and relaxation areas no less. 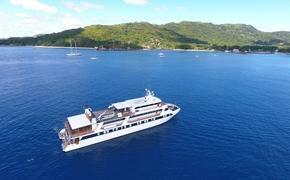 With any luck, the Princess ship will mirror some of these exciting features as well, even if at a smaller scale. The enclosure concept alone would certainly lend itself well to cruises in Alaska, one of Princess’ mainstays, and as Norwegian Cruise Line is set to deploy its next mega ship in the last frontier, so too may Princess decide to follow suit with its own competitor.